Experience an incredible ride and the ultimate custom style on the street, the Victory Jackpot™. This custom cruiser turns heads and is ready to roll up the miles. 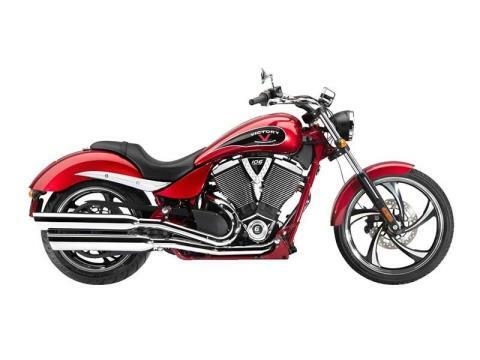 The Victory Freedom® 106 / 6 V-Twin is smooth, efficient - and extremely powerful. It’s fuel-injected, counter-balanced and it delivers 110 foot pounds of torque you can use for great cruising or dominating at stoplights. You’ll have instant throttle response and outstanding power you can unleash on demand. With the outstanding power of the Victory Freedom® 106 / 6 V-Twin, you’ll ride a Jackpot with confidence - and with 110 foot pounds of torque on tap. Use the power to enjoy the best cruising, to head out onto the open road, and to manage traffic with passing power to spare. The Jackpot has the unique style of a stretched custom. Its one-of-a-kind rear fender is designed to show off the pavement-churning 250 mm rear tire. This tire was developed specifically for Victory so it delivers a smooth ride, easy handling - and custom cruiser attitude unique to the Jackpot. Need more Chrome, a backrest or sporty windshield? Add Victory accessories and make your Jackpot all your own. All Victory accessories undergo the same rigorous testing as our motorcycles, so they install easily, fit properly, and deliver outstanding performance. The Jackpot struts down the street with a tall, 21 inch custom-look Stingray wheel. This high-contrast wheel complements the bike’s styling and delivers a smooth ride and easy handling. The Jackpot looks like it just rolled out of a custom shop. It has new Sunset Red & Gloss Black paint and graphics. Its bodywork features the signature Jackpot raised spine running down the center of the bike on the fenders and the length of the sculpted, split-tail fuel tank. Every gear shift is smooth and defined with the Victory six-speed transmission with true overdrive. Its helical-cut gears ensure that each shift is smooth and sure. For interstate cruising, the sixth gear overdrive drops the rpms and amps up your Jackpot attitude. Front: 21 x 2.15 in.Rear: 18 x 8.5 in.